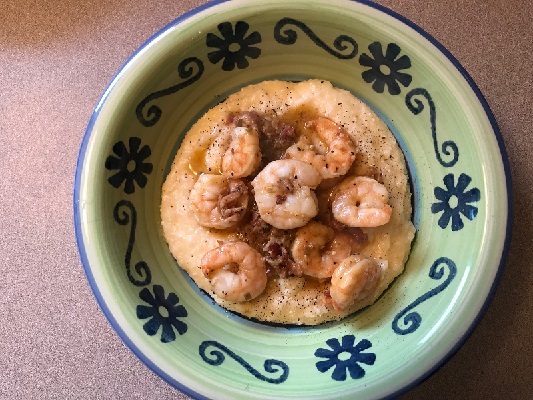 Sauteed shrimp seasoned with Cajun, butter, lemon, garlic, and bacon top our three-cheese grits. Tastes like New Orleans! Packaged in a plastic bag. Thaw in the refrigerator for 2 to 3 days or until completely thawed. Boil 6 cups of water (3 cups for a small). Add the grits and stir briskly. Reduce heat to low, cover and cook 10-15 minutes while stirring frequently. 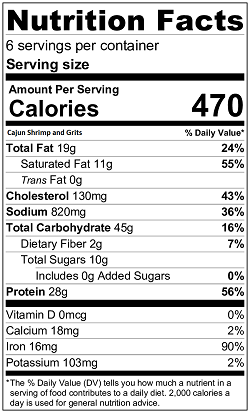 Meanwhile, in a large skillet, cook the shrimp over a medium heat for 4-6 minutes until pink and cooked through. Add the contents of the cheese bag to the cooked grits and stir. Serve the shrimp over the hot grits.